Emergency Warning System: How Do You Handle A Crisis? What do you do as a leader when everything falls apart? The CNote co-founders use money for good. A professional headshot can make the difference in hiring. Gloria's "The Sum" Weekly Column: Are Your Marching? Revisit tips on your social media messaging early in your career. Even before you are asked, offer a colleague help in revising a proposal, researching a project, brainstorming solutions. Ideas expand better together. Be positive and supportive. Monique Lindner speaks on "The Power of Resilience: Building a bridge from trauma to happiness" at TEDxChiangMaiWomen 2017 in Thailand. An open letter to the entrepreneur to show girls how to step into the C Suite. See who are the new up and coming entrepreneurs for 2018. Read about the diets of remarkable women in history. A look back for women one year after the first Women's March. “We are the largest single group of humanity in this country. And yet we are not in leadership roles that reflect that." 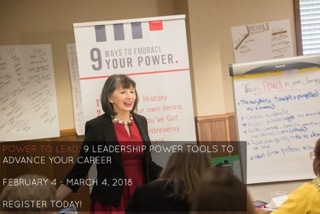 February 4 kicks off our life-changing four week self-study (in other words, do the lessons on your own schedule) online course, Power to Lead: 9 Leadership Power Tools to Advance Your Career, designed especially for ambitious early to mid-career women who want to increase their confidence and leadership opportunities. The first week's lesson is: What’s Power got to do with it? And oh my, you’re going to love our new definition of power! Because we unpack what power means so that we can quantify your relationship with it. Then we examine and practice proven techniques to help you prevent implicit bias from limiting your career success. You will chat, connect, and network with your course mates on the private Facebook page. You will also enjoy a fantastic Facebook live chat with Take The Lead’s cofounder and president, Gloria Feldt, where she will answer all of your questions! Want a sneak peek into the course content? Look here. Celebrate women's leadership equality with our limited edition, Take The Lead women's white t-shirt. This design is ethically produced in the U.S.A. and has a soft, buttery feel. ‘Wearing your truth’ creates a culture of Love Over H8. Each piece is a conversation starter and statement maker. 100% of the proceeds from this sale will be donated back to Take The Lead. Help us spread Love Over H8!